Every day there are political discussions and decisions made that could directly impact your ability to earn a living as a REALTOR®. DAAR is hard at work protecting your business, the industry, and homeowner’s rights! Stay up to date on DAAR’s advocacy activities with DAAR’s Legislative Matters newsletters. In each issue, you will learn about our advocacy activities at the local, state, and federal levels. You’ll also find ways in which you can be involved. Find out the latest legislative and regulatory changes that could impact how you manage your business as a REALTOR® in Loudoun County. Visit our Newsroom to read the latest news releases. Click here to read about the laws passed during the 2018 Virginia General Assembly. Here’s how you can help. Join the Government Affairs Committee! 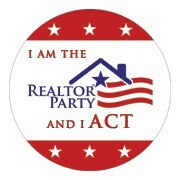 You’ll stay informed on real estate-related issues be an active advocate with the REALTOR® Party.